This map was commissioned for an upcoming tabletop fantasy roleplaying game. I won't link to them, because it looks like the game has not been published yet. The basic layout of the continents was supplied in a simple sketch by the client, and the features you see were developed through many rounds of revision in consultation with them. I had to work out techniques for several types of terrain, going through trial-and-error iterations until I decided a given region looked right. I like how most of those details came out, and I've used variations on those themes in later maps. There's very little in this illustration that's repeated--every mountain is unique, hand-drawn, and connected to the rest of its range. I've had people comment about the "rivers lying on top of the forests" problem in this map. I admit that this simply didn't strike me as an issue when I was drawing it. I've become more sensitive to this issue as a result, and I now try to make sure it doesn't happen on later maps. 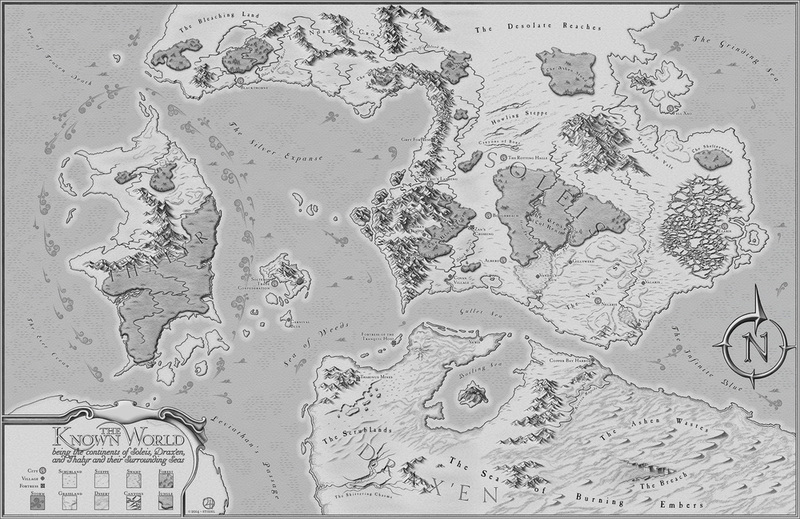 Because Squarespace down-samples images over a certain resolution, anyone who wishes to see a full-res version of the map can click through to the DeviantArt page.